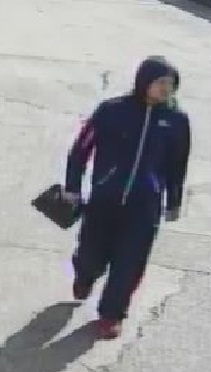 Police have released a CCTV picture of a man they want to speak to about an arson attack on a Walsall butchers. Detectives investigating what happened have called it a "shocking'' arson attack and have issued a CCTV image of a man seen buying fuel at a nearby petrol station. A worker escaped serious injury after two petrol bombs were thrown into the shop in Wednesbury Road, Pleck, Walsall, on June 27. West Midlands Police released video footage two weeks ago, showing an offender outside the shop, and the force has now issued an image of a man seen at a filling station 40 minutes before the attack. A police spokesman said: "This person is now a significant interest to the police inquiry and investigating officers want to trace him as a matter of urgency to either eliminate him from the investigation, or check whether he has any vital information about what happened. "This was a shocking attack on a store in broad daylight and one which could easily have resulted in serious injuries or fatalities. Anyone with information is asked to call the Violent Crime Team at Wednesfield police station on 101 or Crimestoppers anonymously on 0800 555 111.